Hydrangea heights vary greatly depending upon species and particular varieties. From low-growing shrubs to small trees, hydrangeas provide great versatility in both size and color. Identify those hydrangeas that belong to different height groups when planting in the home garden. Whether you need a specimen plant, a trailing variety for decorating a fence, or flowers for mass planting, there's a hydrangea to satisfy your gardening space. For hydrangea plants that reach full height potential, appropriate care is essential. For vigorous plants, plant hydrangeas in full sun exposure during the morning and shade in the afternoon. Morning sun dries dew as a preventive measure to avoid fungal infection. Maintain well-drained soil high in organic content, according to the Clemson University Extension. 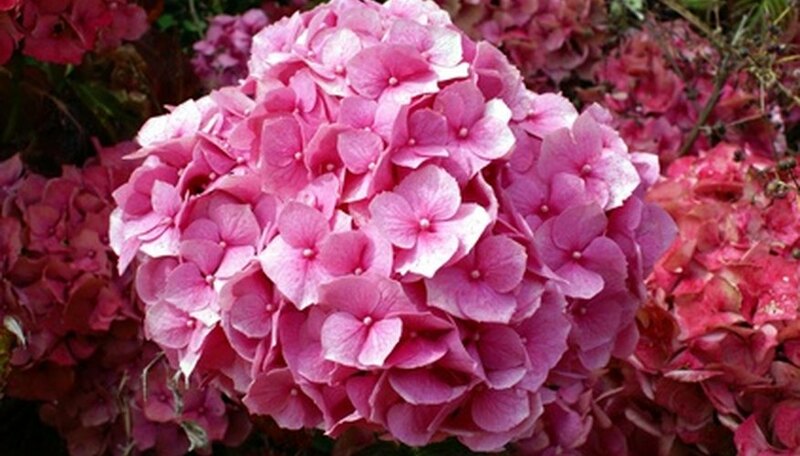 Do not plant hydrangeas in areas affected by extremely warm temperatures or drought as injury may occur. Hydrangea deciduous bushes are available in short options including French hydrangea (Hydrangea macrophylla); the French hydrangea group Hortensia includes All Summer Beauty, a shrub reaching 3 to 4 feet in height, and Carmen, a pink flowering hydrangea plant reaching 4 feet tall, according to the Clemson University Extension. The Hydrangea serrata plant is also short, measuring up to 5 feet; its cultivar Blue Billow measures only 3 feet tall. The French hydrangea lacecap variety Blue Wave gets as tall as 6 to 7 feet with flowers that resemble a pinwheel, according to the Clemson University Extension. Smooth hydrangeas (Hydrangea arborescens), also referred to as snowball hydrangeas, are deciduous shrubs that measure 5 feet tall with spherical clusters of white flowers. Oakleaf hydrangeas (Hydrangea quercifolia) are medium in height, growing to 4 to 6 feet with a display of white flowers, according to the Ohio State University Extension. Peegee hydrangeas (Hydrangea paniculata), also referred to as Grandiflora, are considered large shrubs or small trees with their height potential range of 10 to 25 feet with green leaves that become bronze hued during autumn, according to the Clemson University Extension. With a fast growth rate, other cultivars of Hydrangea paniculata are also tall, reaching a height of 10 to 20 feet, according to the Ohio State University Extension. While most hydrangeas are deciduous shrubs, there are climbing deciduous vine varieties that ascend structures to great heights. Climbing hydrangeas (Hydrangea anomala) grow to an extremely tall 60 to 80 feet in height. Climbing varieties generally display white flowers. Though the growth starts off slowly, established vines grow quickly to attain their full height potential, according to the Ohio State University Extension.